Usually we have no use for 9 volt batteries except in the smoke detectors in our house. 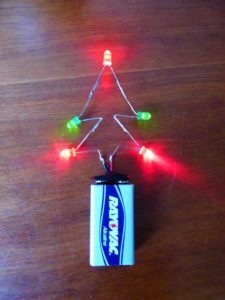 Here we will show you how to make a fun Christmas decoration using a 9 volt battery and 5 leds. 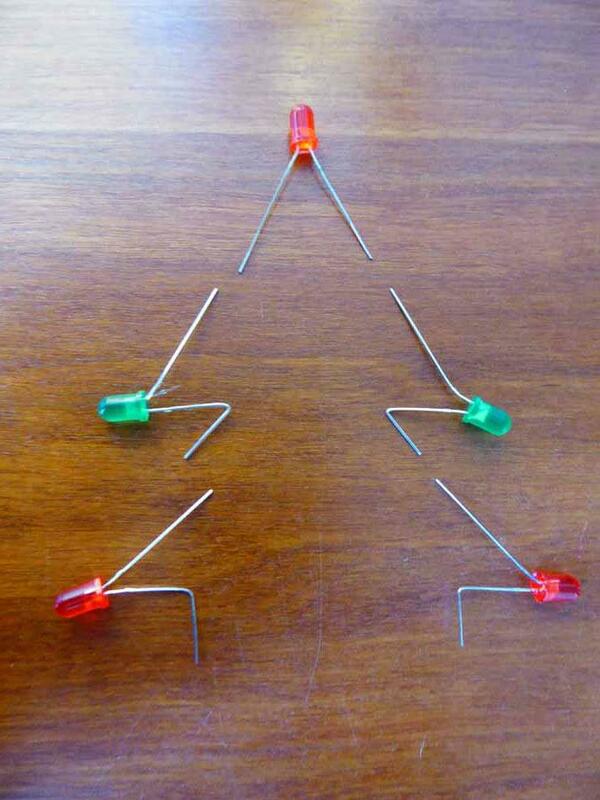 First we will set the leds up on the breadboard so we can refer to it if needed when making the tree. Click on the photos below to make them bigger. Here is our list of parts. We have linked to places to by similar parts. We did not use these exact parts in making this project. You will also need needle nose pliers, a soldering iron like a Weller WLC100 and some solder. Before we begin let’s talk about leds briefly. LEDS come in a lot of sizes like 3mm, 5mm and 10mm. The can also come in a surface mount package which is very tiny. 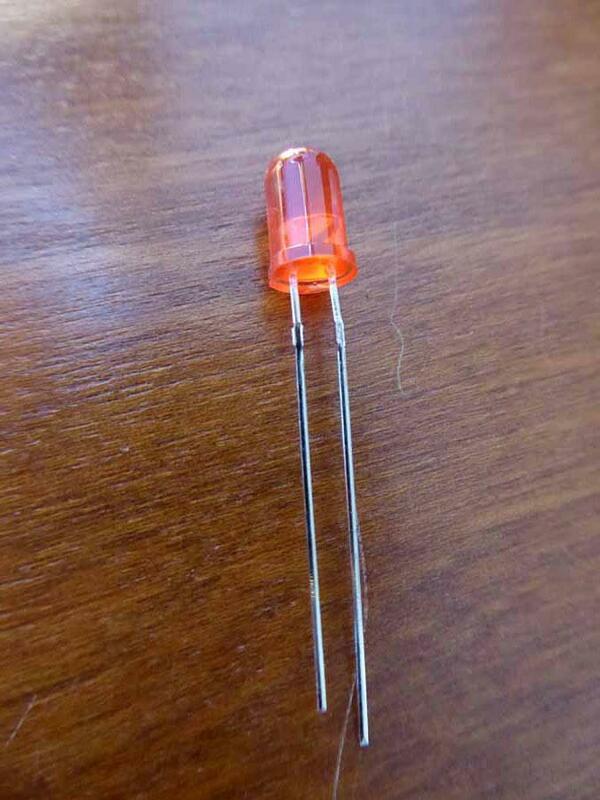 Here we are using 5mm leds like this red one. Notice how one lead is longer than the other. The long leg or lead is the positive side and the short leg is the negative side. 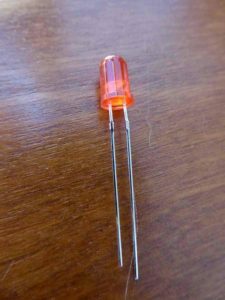 Two other factors in leds are also important. One is how bright the led is and the other is called forward voltage. Led brightness is measured in millicandela or mcd for short. Leds can vary in brightness anywhere from 180 mcd through 2500 mcd and sometimes even higher. 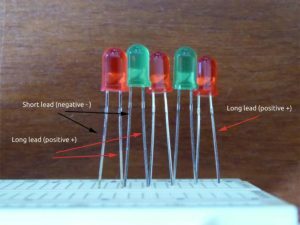 Forward voltage is how much voltage the led uses when it is on. Most 5mm leds have a forward voltage around 1.8 – 2.2 volts. Red leds tend to be a little lower than green leds. That is why they are sometimes a little brighter than the green ones. Enough led theory, let’s start making! In this project we will be putting the leds in series, not parallel. That means we need to connect the short lead of one led to the long lead of another led. 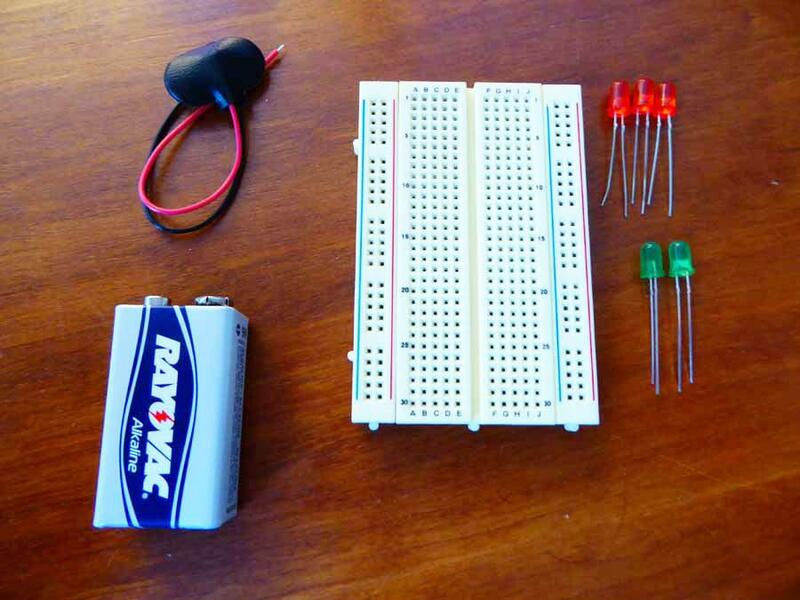 First setup your leds on the breadboard. 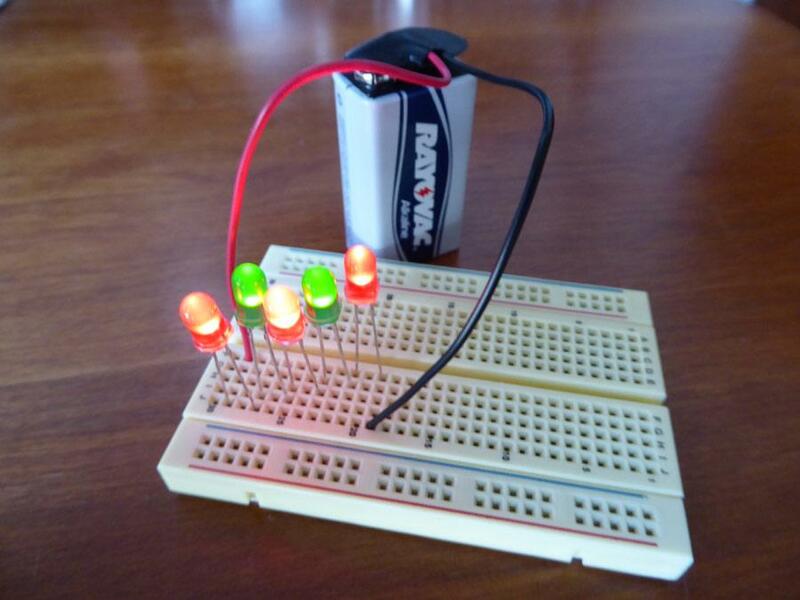 Put you leds on the breadboard in series. 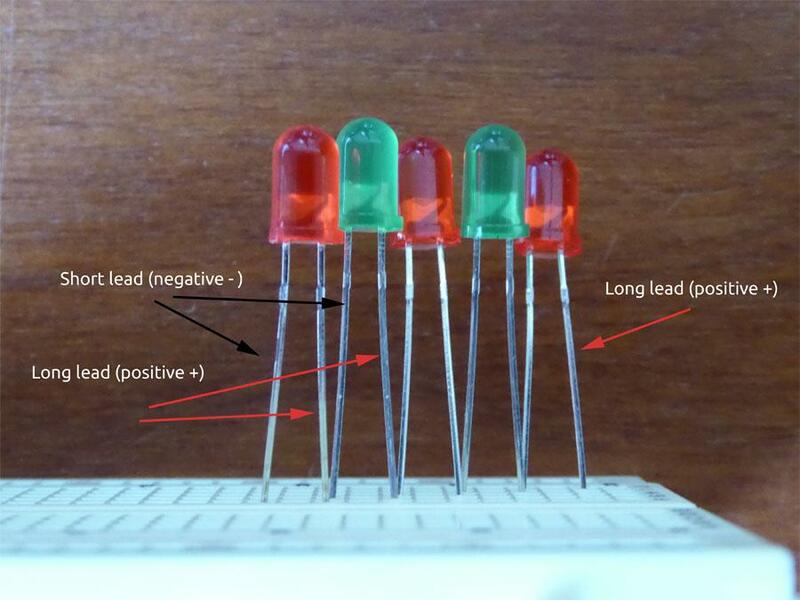 Take a red led and insert it horizontally into two holes and remember which lead is long or positive. 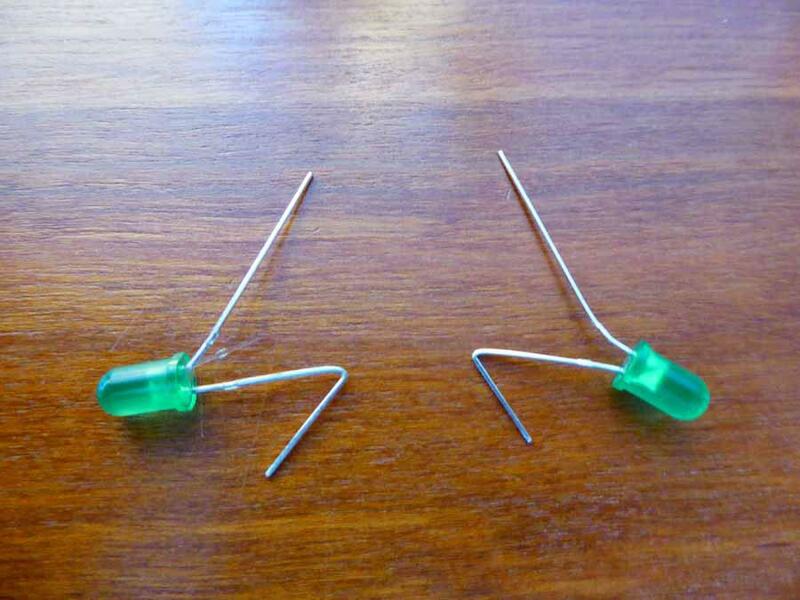 Now add a green led with the long lead inserted into the same column as that of the long lead of the first led. Once all the leds are connected put the 9 volt battery connector onto the battery. Now connect the black or negative battery wire to the short lead of the first led you put on the breadboard. 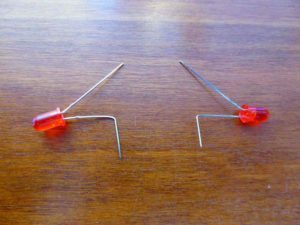 Connect the red or positive battery wire to the long lead of the last led you put on the breadboard. All of your leds should now light up. Now that the breadboard version is working leave it alone. You can refer to it if needed when putting the tree together and use the extra leds to make a second tree when the first one is done. In this photo you can see we have laid out all the remaining leds. The red led on top has the long lead on the left and the short lead on the right. That means the green led on the left must connect it’s short lead to the long lead of the red led on top. 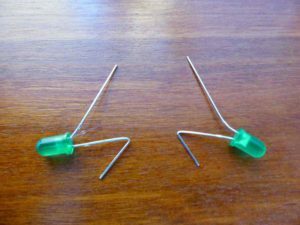 The green led on the right is exactly the opposite with the long lead connecting to the short lead of the red led on top. 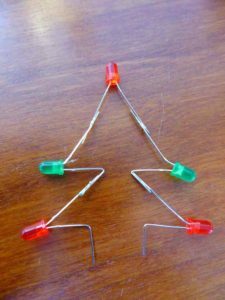 Now start bending your led leads into the correct shape using your pliers. Refer to the photos here. 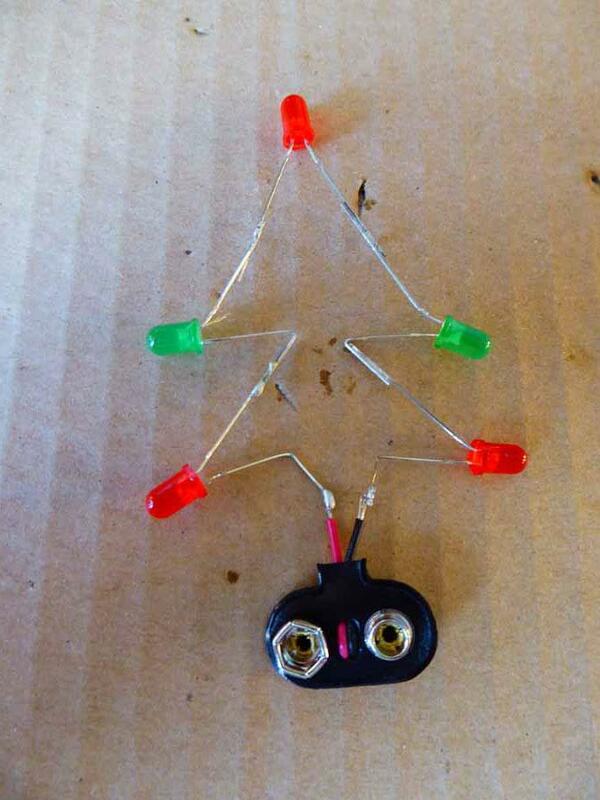 Once you have all the leds bent and into a Christmas tree shape you like it is time to start soldering them together. 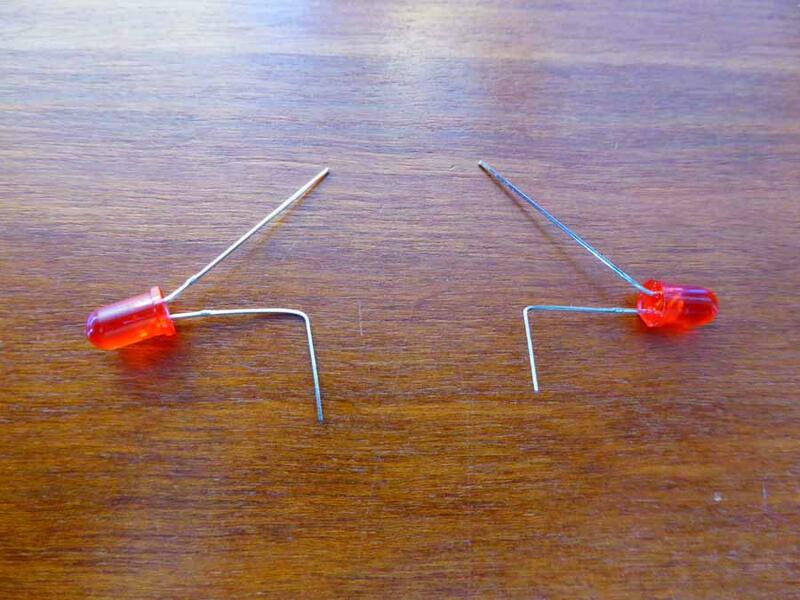 Remember which lead is short and which one is long and lay them out once you have bent them. Take the red led from the top and solder one of the green leds to it. Leave the other leds alone but still in the tree pattern. We didn’t have any helping hands nearby, so we just taped the leds onto cardboard to solder them together. We lined up the leads we wanted to connect so that they were touching and soldered them. 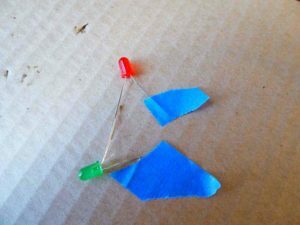 You could also bend small hooks in each end and connect them that way too. 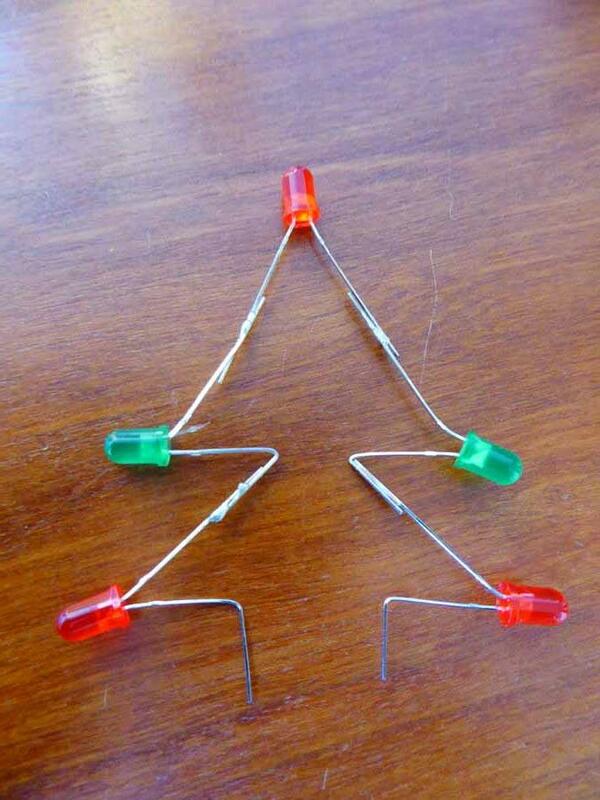 Once the first two leds are soldered together, continue with the second green one and then the remaining red leds. 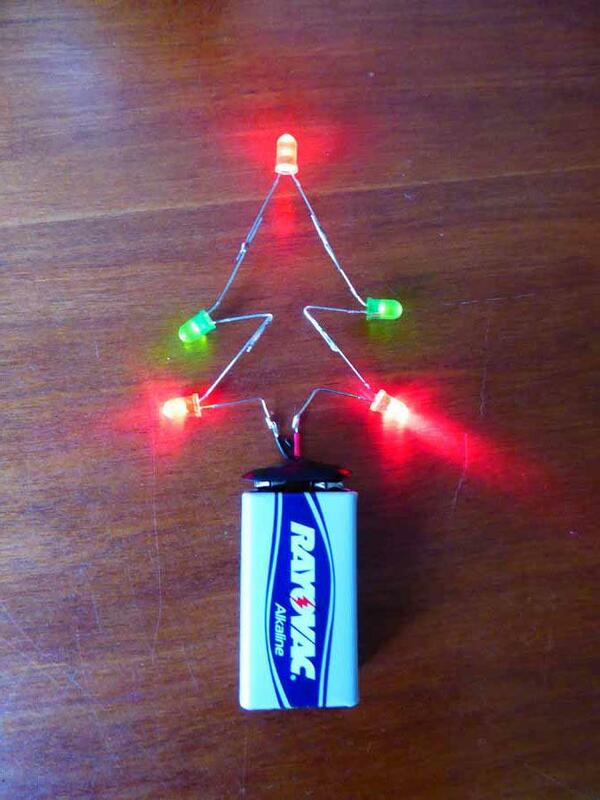 You should end up with an led tree like this one. Now it is time to add the 9 volt batter connector. If the bare metal ends of the wires are not long enough, strip off more of the plastic coating. you want about 1/4″ of bare wire. Now take the black or ground wire from the connector and bend it around the red led with the short lead. Solder them together and then connect the red wire to the other red led and solder that as well. You should end up with your leds and connector looking something like this. 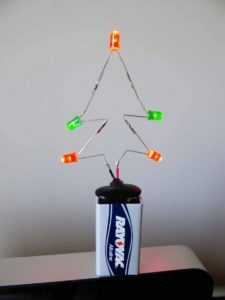 Now connect the connector to the battery and watch your Christmas tree light up! 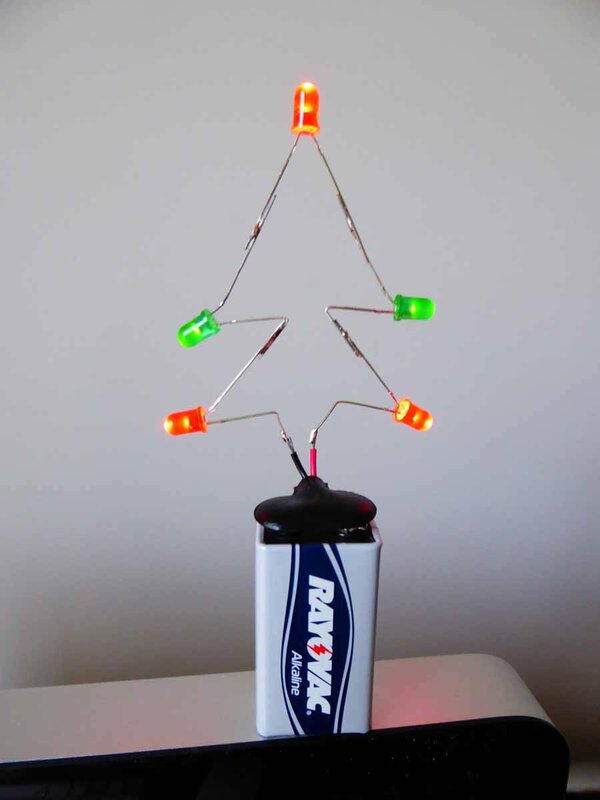 Here is what our led Christmas tree looks like.